For the people who make them, the problem with unboxing videos must be that you have to wait too long to put on that watch or use whatever it is you’re unboxing. Shooting an unboxing video puts a wall of minutes between you and that new watch. Shooting an unboxing video also makes everyone around you—your spouse, your kids, even your cat (who undoubtedly wants to be in that box, even if it’s just a watch-sized box)—think that you're stranger than you are. Unboxing videos or photo sets are also like wristwatch reviews that dilly dally around a watch company’s history or the inspiration behind a particular watch until the reviewer finally gets around to telling you what he or she thinks of that watch. As this review is doing now. Sorry. So let me say this without any more delay: the Christopher Ward Trident Pro 600, which I put on my wrist as soon as I could tear open the mailing package, surpassed my expectations. This is a diver watch that belongs in the movies. It’s not really true that watch photos don't do justice to a watch and that you have to see that watch in person to appreciate it. Professional watch photos are pretty darn good, and the watch itself can be a letdown when you actually touch it. But the Trident Pro 600 is a watch whose online photos, while crisp, clear, and catchy, are nothing compared to the way it looks in the three-dimensional world. It looks beautiful in a room under fluorescent lights, but it looks absolutely mesmerizing outdoors. The Super-LumiNova SLN-T-C1 hands and number markers start absorbing the sun’s rays instantly, and even though Super-LumiNova doesn't glow in sunlight, the lustrous hands and number markers, contrasting with the guilloche wave pattern watch face, give this watch a sensation of depth and texture. I have the black face and burgundy bezel model. Like many watch collectors, I obsessed over what color/face/band combination to get. When I finally choose a black face, burgundy bezel, and steel bracelet, I put down my third beer and prayed to the god of watch choices that I made the right decision. Shipping from England to Japan meant that I had about a week to suffer in uncertainty. I made the right color and band choices. For me that is. You might prefer a white face, or black bezel, or leather bracelet, or some other choice. (I was first tempted to go with a green bezel, but to my surprise, since getting the watch I’ve managed not to look at pictures of alternative Trident Pro 600s and think…) I have the 38 mm model. The Trident Pro 600 also comes in a 42 mm version. This is a seriously handsome watch. It’s eye-catching. It could even make George Clooney look better, if he wore it. I like the well-proportioned sword-shaped hour and onion-shaped minute hands. The second hand has a small trident on the short end as a counterbalance—the watch’s signature—which could have been an in-your-face element, but instead is subtle and beautiful. The 38 mm and 42 mm models are both 13.3 mm thick. Sometimes, a small-diameter dive watch can be too thick, giving a tree stump look. But the 38 mm model looks and fits fine. The watch has a solid feel, and an it'll-do-the-job-and-look-great-doing-it appearance. The unidirectional bezel is made from tough zirconia ceramic. The crystal is sapphire and the watch itself is shock resistant. The screw-down crown is strong and easy to use. The Trident Pro C60 is water resistant to 600 meters, making it one tough cookie. Needless to add, it’s going to outlast your friend’s smartwatch. Inside this automatic watch you’ll find an ETA 2824-2/Sellita SW200-1 movement. It has a 38-hour power reserve. 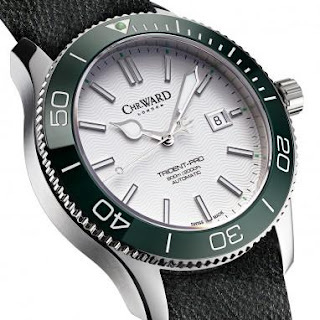 Christopher Ward Trident Pro 600 with green bezel. 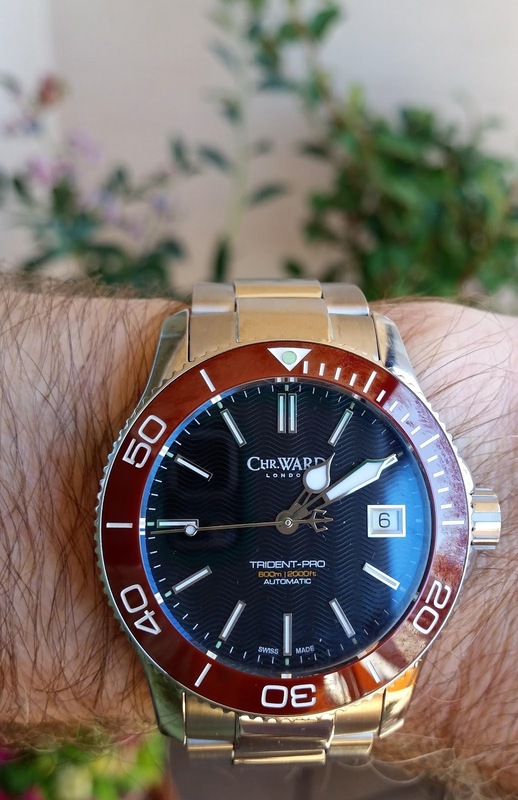 Depending on the bracelet you buy, the Christopher Ward Trident Pro 600 costs between US $930 and $1,025 (roughly, because the pricing in British pounds.) The 38 mm and 42 mm models cost the same. For an extra $15, Christopher Ward will size the bracelet for you. If you have your bracelet sized, be sure to measure the part of your wrist where you actually wear your watch, rather than the thinnest part. Any removed links come with your watch. Should you buy it? If you want to wear a watch that looks like it should cost three, four, or even five times what you paid for it, yes. If you want a diver watch that also looks right under a suit jacket’s sleeve, yes. If you want to wear an accurate, English-with-an-Swiss-accent watch that will withstand everything from a steamy shower to a scuba tour at Australia’s Great Barrier Reef, yes. If you want a watch that you're going want to peek at all day long, then especially yes.